Sri Lankan Billionaire Nahil Wijesuriya controlled East West Properties owned Weligama Hotel Properties Limited (WHPL) is being sold to Singapore's Hotel Properties Limited (HPL) founded by Singaporean billionaire businessman Dato' Ong Beng Seng for US $ 22.62 million, with the Central Bank managed Employees' Provident Fund (EPF) signing the deal, recent disclosure to Singapore Stock Exchange said. Forbes estimates the net worth of Ong and his wife at US $1.8 billion and Ong's business approach is said to be buying when rents and properties are cheap and sell when they are not, according to international media reports. On 11th April 2019, Singapore Stock Exchange (SGX) listed Hotel Properties Ltd in a disclosure said that the Directors of Hotel Properties Limited wish to announce that its wholly owned subsidiary, HPL Properties (West Asia) Pte Ltd (“HPLPWA”), has entered into Share Purchase Agreements with East West Properties PLC, Asia 2000 Investment Inc and The Monetary Board of The Central Bank of Sri Lanka as the “Sellers” for the proposed acquisition of the entire equity interest comprising 405,200,000 ordinary shares collectively owned by the Sellers in the capital of Weligama Hotel Properties Limited (“WHPL”) to HPLPWA. Sri Lanka’s largest private sector workers’ pension fund - EPF owns 45 million shares in WHPL, or a 11.10% and reports highlights that the EPF stake was bought for Rs. 405 million, or Rs. 9 a share in 2014, and its book value was the same as at 31 December 2018, according to EPF data. Local media reports also noted that the Central Bank has been delaying the sale of WHPL to HPL to obtain a valuation for the shares it owns, after the deal was announced in March 2018. Accordingly the sale to HPL is at Rs. 9.77 a share, assuming a Rupee to US dollar conversion rate of 175 (Rupee closed at 174.60/75 to the US dollar in the spot market on Thursday 11th April 2019. However the disclosure to SGX further added that the consideration for the proposed Share Purchase is approximately US $ 22,625,000/- or US $ 22.62 million, which is subject to net working capital adjustments to arrive at a final consideration. Meanwhile several media reports in Sri Lanka further highlighted that the final consideration for full deal price will be around US $ 58 million along with the working capital adjustments. Meanwhile Sri Lankan Billionaire Nahil Wijesuriya owned East West Properties PLC (EAST) in a separate disclosure faxed to Colombo Stock Exchange (CSE) on 11th April 2019 (16:39 hours) but released to public by CSE on 12th April 2019 said that the Directors of the company has entered into a Share Purchase agreement with HPL Properties (West Asia) Pte Ltd for the sale of 71.82% stake amounting 291 million ordinary shares of WHPL which owns Weligama Bay Marriott Resort & Spa for a consideration of US $ 15,934,952 or US $ 15.93 million. Back in early April 2013 it was announced to public and media reports highlighted that to part finance the construction of Marriott Weligama Bay Resort & Spa, Weligama Hotel Properties Ltd. On 8th April 2013 announced plans to raise Rs. 1.75 billion equity capital by a private placement to be followed by an IPO. That time it was announced that the company plans to issue 195 million new ordinary shares at Rs. 9 each and the issue was to open on May 2013, according to Bank of Ceylon, the managers to the private placement. Meanwhile the latest annual report of East West Properties has valued the Land and Buildings of WHPL which owns Weligama Bay Marriott Resort & Spa for total of over Sri Lankan Rs. 5 billion whilst Weligama Hotel Properties Limited obtained US $ 23.344 million from Bank of Ceylon and US $ 1.371 from Sampath Bank PLC for the part finance of the Marriott Resort & Spa Hotel project at Weligama. The annual report also states that Exchange rate movements are constantly monitored and that the revenue is pegged on the US Dollar ($) rate, hence it works natural hedge for the loan interest. In accordance with the agreement entered into with the Board of Investments (BOI) of Sri Lanka, profits of Weligama Hotel Properties Limited are exempted from income tax for a period of 10 years from the year in which the company commences to make profits or any year of assessment not later than two (2) years reckoned from the date of commencement of commercial operations whichever year is earlier as per Section 17 of the Inland Revenue Act No.10 of 2006. Other Sources of income of Weligama Hotel Properties Limited is taxed at 28% in accordance with the provision of the Inland Revenue Act No.10 of 2006 and amendments thereto. The hotel commenced commercial operations on 20th July 2017 according to the annual financials. 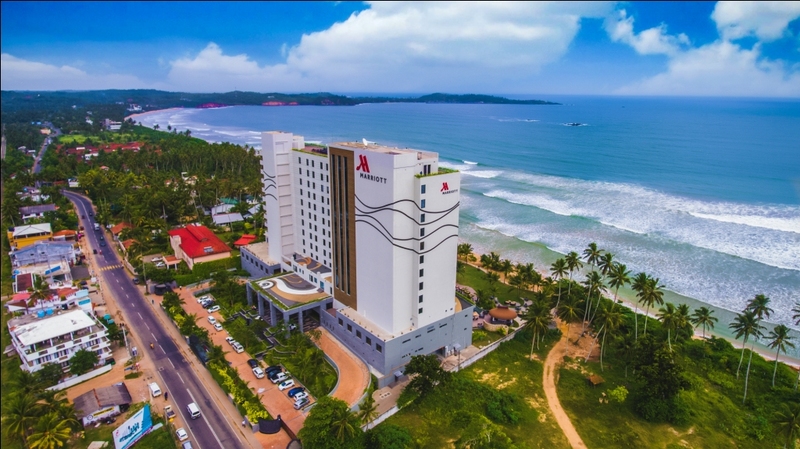 Weligama Hotel Properties Limited (WHPL) owns a 198-key 5-Star Resort known as the Marriott Weligama Bay Resort & Spa (managed by the international hotel chain Marriott), situated at Weligama, Sri Lanka. The issued and paid up capital of WHPL is Sri Lankan Rs. 1,931,801,000/- or Rs. 1.93 billion comprising 405,200,000 ordinary shares according to the disclosure made by HPL to Singapore Stock Exchnage (SGX). The disclosure further added that following the Proposed Share Purchase, the HPL Group through HPLPWA and its nominee will collectively own 100% of the equity of WHPL and that the Proposed Share Purchase will be funded through the Group’s internal resources or bank financing, and is not expected to have any significant effect on the consolidated net tangible assets per share and net earnings per share of Singapore’s HPL Group based on the audited consolidated financial statements of the HPL Group for the year ended 31 December 2018. According to reports HPL acquiring WHPL marks Singapore based HPL’s second purchase in the Sri Lankan leisure market in less than a year, after it acquired a 94.7% stake in the 35-key Tangalle Bay Hotel owned by Sri Lanka’s Tangalle Bay Hotels for US $ 385 million or US $2.2 million in August 2018. The corporate profile of HPL highlights that it has interest in 32 hotels under hospitality brands such as Four Seasons, Hilton International, Como Hotels, InterContinental Hotels Group and Six Senses Hotels. Further, HPL group also manages its own portfolio of hotels under established brands such as Hard Rock Hotels and Concorde Hotels & Resorts. Accordingly HPL group owns hotels, resorts and shopping galleries in 13 countries including Singapore, Malaysia, Thailand, Indonesia, Maldives, Seychelles, Vanuatu, Bhutan, Tanzania, South Africa, Vietnam, the US, UK and Sri Lanka. rumour of massive divi ????? Crazy buying, but at the end some selling pressure was witnessed. I sold all my shares & bought EAST @ 19. Hope my decision is right. Lets see how it will go. Good sentiment booster, lets use as trading opportunity. But keep in mind, in this CSE that everybody cant be a winner.. end of the day! there will be looser too! So be careful. After long awaiting i also bought some @ 18.50 due to the presser of collection. There was a crossing too...lets hope the better. Hope that EAST management and related parties have collected enough to face the forthcoming event! All times are GMT+5. This page was generated at 06:06 AM.